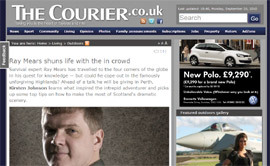 This entry was posted in Ray Mears on September 29, 2010 by Woodlore Team. What’s the crack: You really have a complete misunderstanding about how the real world operates lol. First of all I work in the media sector and publishing DVDs and DVDs of older works is an enormous minefield, and extremely costly at that. You seem to think that Ray can just publish a DVD at any time when he likes! That is just not the way this process happens – it would take years to get all the rights worked out on the music and content, a legal nightmare. As for Ray making money from his venture, Woodlore is a business at the end of the day, and I’d guess all of the funds are reinvested. Isn’t Ray allowed to run a business? I can’t see Ray taking it easy in some luxurious setting; that’s just not his style. I love rays work but i do feel as though its become a huge money making venture. Which goes against what bushcraft/wilderness living stands for. I love all the bushcraft/nature stuff he does and his tv personality. I dont know him personally but i find there is something strange going on with the sales side of things. Why do the dvd’s cut out stuff shown on the tv? Why do woodlore/bbc/whoever not release dvds of rays earlier work such as country track, wild tracks, ray mears rocks etc? There is a massive call for them but no rush to produce them! Why? Hopefully someone from woodlore or the main man himself could explain. All ‘interested parties’ will always seek to understand Ray Mears and all that he has come to ‘stand for’.Perhaps they hope to find parallels within their own lives or just deepen their understanding of this highly respected man. In an age full of unrest,uncertainty and fragmentation Ray provides us with some ‘old school’ values and ‘comfort’..He appeals to one and all.The man uses the vehicle of Bushcraft to capture our imaginations ,delivering it with his own ‘take’on life. Everything from Himself through to all his staff at Woodlore embody this great sense of “doing things properly”. How many of us will be able to contribute to society so effectively and yet so quietly ! An interesting read. For some reason, i always thought it was Ray’s father that had inspired him to a life of wilderness living, and that he was a ghillie. Is there any plans for a biography, as to allay my misconceptions. Scratch that idea, small snippets of information like the article are somtimes more juicy than digging for Pignuts.